Thinking about a trip to Portugal? While the country is most famous for its beaches and endless summer sun, it’s worth considering vacationing at other times of the year. If you visit in winter, you’ll find cheaper prices, fewer crowds, great food—and probably plenty of that sunshine as well! Here are five reasons why you should consider heading to Portugal in winter. Unlike much of the rest of Europe, most of Portugal doesn’t suffer from grey skies or freezing temperatures in the middle of winter. While it regularly snows in the interior of the country, Portugal’s long Atlantic coastline often sees sunshine and blue skies at that time of year, especially in the south. It’s not unusual for temperatures to reach the mid-sixties in the Algarve in January or February—warm enough to sit outside and enjoy a glass of wine in the sun—and Lisbon is often only a little colder. It’s a different story in the north, however, as Porto is typically grey, chilly, and damp at that time of year. Another option for the winter sun is to visit one of Portugal’s two island chains. Madeira lies off the coast of North Africa, and regularly sees temperatures in the mid to high sixties. While rain is a definite possibility in late winter, it’s far from guaranteed, and the temperate conditions make hiking and other outdoor activities more enjoyable than in the mid-summer heat. If you happen to time your visit for New Year’s Eve, you’ll also witness one of the biggest and best fireworks celebrations in the world. The island’s capital, Funchal, set a Guinness world record in 2007 for the largest fireworks display. The Azores, sitting out in the mid-Atlantic, is also surprisingly mild during the winter months. Daily maximum temperatures in the low sixties are typical from December through March, although again, like Madeira, you’re more likely to get some short-lived rain during your stay as well. While the Algarve has been a favorite of British and other European holidaymakers for decades, most of the rest of Portugal was a bit of a hidden secret until recently. That’s no longer the case, though, with both Lisbon and Porto now very much on the tourist radar, and seeing hordes of visitors from mid-spring until mid-fall. During peak summer months, it can be hard to move at the major tourist attractions, or on the narrow downtown sidewalks of either city. Since many restaurants and bars are North, they’re also often filled to overflowing, with endless demands pushing the patience of stressed-out wait staff. Combine that with the high temperatures, and visiting in July or August starts to look less appealing. Winter, though, is a whole different story. With cooler temperatures comes a huge reduction in visitor numbers. The pace of life slows down, it’s possible to walk into most restaurants without a reservation and still get a seat (although don’t try it with ​the Michelin-starred places! ), and even popular spots like Sintra see a fraction of their summertime visitors. If you’re happy to forgo sunbathing in favor of a less crowded and stressful visit, definitely plan it for winter! Since visitor numbers drop off so much in winter, there’s plenty of spare capacity on all the services that cater to them. Planes, trains, rental cars, and accommodation are all under-booked between about November and March, and that means big discounts are on offer. While hotel and Airbnb prices in Lisbon and Porto in peak season have skyrocketed in recent years, they plummet in winter. It’s not unusual to see discounts of 50% or more in January and February, as hoteliers and landlords desperately try to fill their empty rooms. Post-Christmas, flight prices are also noticeably cheaper, both from the United States and elsewhere in Europe. Once you’re there, getting around by train, bus or car can be almost embarrassingly cheap, especially if you book in advance. The three-hour one-way train ride from Lisbon to Porto, for instance, can often cost under ten euros. 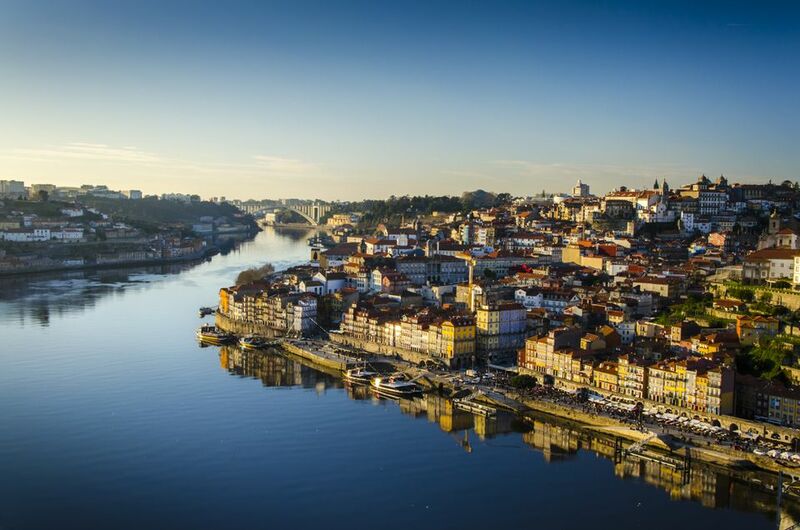 Portugal is one of the least expensive countries in Europe at all times of the year, but in winter, it’s positively cheap to visit! If you’re keen on surfing, or just like to watch the professionals do it, definitely plan your trip to Portugal for the least expensive months. Nazaré, around a ninety-minute drive north of Lisbon, is famous for its towering waves, and they’re at their peak in winter. The world record for the largest surfed wave in the world was set here just a few years ago, and top big-wave surfers descend on the small town whenever conditions are right. If trying to master 100-foot breakers seem a little ambitious, head elsewhere on the mainland, or to the Portuguese islands instead. No matter where you go, winter makes for bigger, better conditions in all of the country’s surf spots, and you’ll have far fewer people to share the waves with when you’re there. Of course, the Atlantic isn’t renowned for its balmy water temperatures at the best of times, and that’s particularly true in the middle of winter! If you’re planning to spend any time in the ocean, be sure to pack or rent a very thick wetsuit. Portuguese cuisine isn’t well-known elsewhere in the world, which is quite a surprise. The country excels in simple, delicious seafood and meat dishes, often paired with inexpensive, yet very drinkable, local wine. While lighter dishes dominate during the long, hot summers, winter sees more hearty fare appear around the country. One of the heartiest of all is the cozido, a form of stew that’s heavy on the animal products. Various cuts of pork, chicken, and beef typically all make an appearance, along with boiled vegetables and potatoes. Every region (and probably, every cook) has a different version, so it’s rare to get exactly the same thing twice. Don’t expect to see it at tourist restaurants or high-end places, though—cozido is definitely a simple, local affair. The colder months are also a great time to check out caldo verde (green soup). Winter is when it traditionally makes an appearance on the menu, although you’ll likely be able to find a few places selling it throughout the year. Often just called "sopa" or "sopa do dia" (soup of the day), this simple, warming bowl usually contains kale, onions, potato, garlic, and olive oil, often with some local pork sausage thrown in for good measure. Much like cozido, no two bowls are ever exactly the same.